Much has happened in the last week or two; most of it has been really great, but some of it feels like I am in slogging my way through quicksand. Despite appearances to the contrary where the bags are concerned, patience is not my strong suit. I am ready to be the next Judith Leiber NOW….but, the universe evidently has other plans, because for every step forward I take, I seem to take two steps back. Or as a friend of mine so aptly puts it “if you want to hear the sound of God’s laughter, tell him your plans”. The good news is that several of my bags have been accepted into Julie’s Art to Wear in New York. One of my best collectors brought this amazing boutique to my attention, having been a patron of the store for many years. Julie Schafler Dale practically created the art to wear movement, and her store, on Madison Avenue, is an institution. And no, NOT the kind you would expect me to be locked away in, thank you very much! I also finished my first jaguar bag. I have done jaguar evening bags before, but nothing this elaborate. It has 23 carat gold leaf on the front and back of the bag, which is also lined with a matching print. It comes with a jaguar print hand made clutch as well. 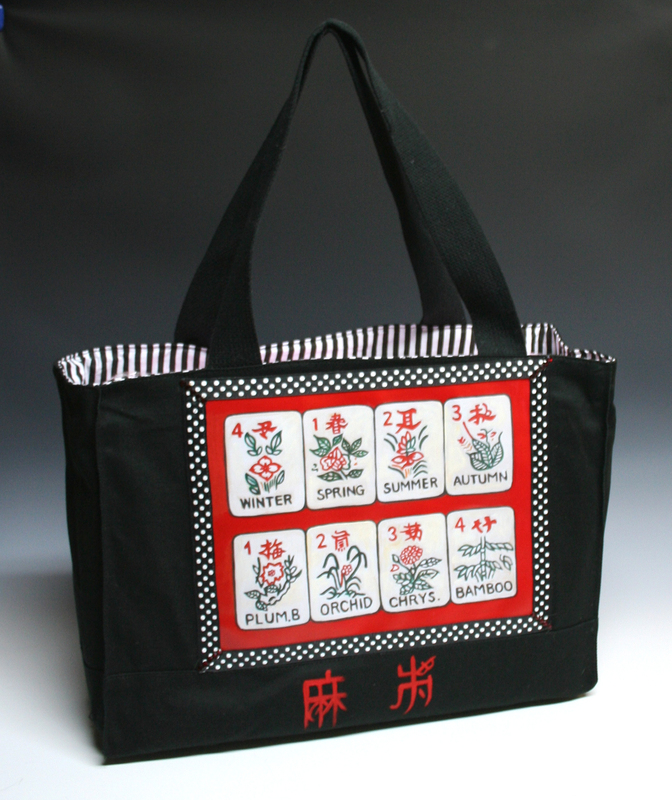 I finished my first Mah Jongg bag…this one is a tote, and I am already in discussions with the head of the American Mah Jongg League to take samples to their next competition for the purposes of selling these new beauties to a captive audience. The image on the front of the bag features the flower suite, and the handpainted symbols on the bottom are Chinese for…what else? Mah Jongg!!!!! I have been wait listed for two shows; the American Craft Council Show in Baltimore, and the Palm Beach Craft Show in Palm Beach Florida. That’s not so good, but its better than being told they don’t want you at all, right? The trade show in Florida didn’t go as well as anyone would have liked. But on the other hand, I am in discussions with a boutique in Maryland that looks promising. And finally, I made my You Tube debut as promised. I’ve gotten 336 hits so far in the first week alone, and a spam email from someone trying to sell me on signing up with their service to help promote the segment. How did I know it was a spam email? Because whoever wrote it told me I had “an amazing voice”. I would have clicked on the link if he would have said I had an adequate voice. After all, there IS still such a thing as truth in advertising, isn’t there???? Don’t forget that I am offering 20 percent off any handbag on my site until December 1 along with free shipping. So let me know what you want for Christmas and I will have my elves get right on it. But first, I probably need to find some elves…..